Posts about the GovIntranet WordPress theme. As promised, we’ve published the code for the WordPress theme based on the DCMS intranet. You can get the theme code from the Helpful Technology GitHub under the ‘govintranet’ repository. To accompany the code, we’ve also released an intranet showcase site where you can have a look at a working version of the intranet theme based on content from the DCMS intranet. You can’t post in the forums. We’ve removed all downloadable documents linked from content, and recent news is made of dummy text. The remaining content is typical of any government intranet. The GovIntranet WordPress theme is a modified version of the DCMS intranet theme. It supports news stories, tasks, guides, projects, vacancies and blog posts. You can extend it with other plugins and widgets. The theme offers a little extra functionality and flexibility to the original DCMS theme and includes the latest iterations from DCMS. The showcase site demonstrates an extra WordPress plugin for polls – to show what’s possible. There are also a few additional custom templates, not included in the basic theme, for a document finder and a jargon buster – again, as a teaser of what’s possible. What does Open Source mean? I have been guilty of confusing the meaning of open source in the past and equating it with freeware. Open source means that you get the code to use as you wish, as long as code remains open. Some code is free, with or without support, paid or unpaid, and some code you pay for, with or without support. But whether code is sold or given away, it’s the source code and not the compiled executable. And as a small business, it’s what we do with the code, where we store the code and the associated databases, how we train people to use the interfaces generated by the code and the ongoing support and maintenance of the systems using the code that isn’t free. As long as the code remains open. In terms of open source, the code is available and we’d love to work with other departments who are thinking of updating their intranets, both in terms of developing and customising this WordPress theme for the benefit of a gov.uk intranet community, and in terms of providing installation, training, hosting and support. We’re a small business so we can’t offer unpaid support or consultancy for this WordPress theme. But we will publish any enhancements to the theme that we develop during the course of paid work. If you want to work with us to use and develop the theme, we’re on the G-Cloud or happy to take a purchase order. And of course, you’re free to take the theme to any other WordPress agency to use and adapt openly. 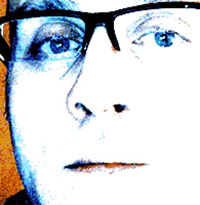 Some WordPress plugins aren’t free. We have used paid plugins on the DCMS theme for the search engine and forms entry, which we believe perform better than the default or free alternatives. And just as you can’t just plugin Google Search Appliance and get a better intranet search experience, this WordPress theme won’t give you a better intranet overnight, because both rely on paying attention to the content. Information on the showcase site demonstrates the type of content used for the DCMS intranet and it is this well-written and well-organised content that makes for a great user experience. We’re happy to provide advice on this too. For more details contact Helpful Technology. For a live tour of the DCMS intranet, Andrew Simpson and I will be online at the tail end of the 24 hour, round-the-world intranet tour, Digital Workplace 24 on 15th May. 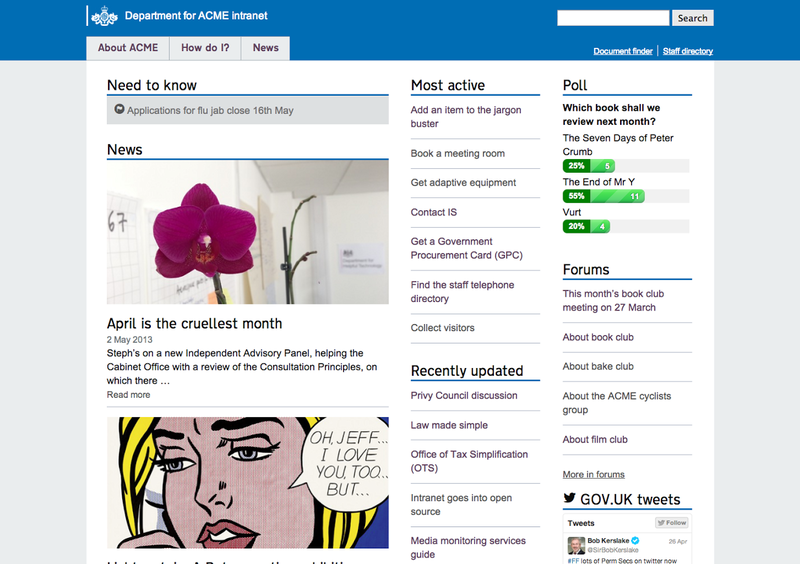 DCMS continues to follow the GDS design principles as the new intranet goes into beta this week. It’s not finished yet. It’s not 100% perfect. And it’s available for staff to use and provide their feedback. At my last check, the team have loaded 375 tasks and guides into the How do I? section which will form the main content of the intranet. There’s more to do, but I love the way that Andrew Simpson and his team aren’t waiting until everything is 100% complete and signed off before a big bang event. The structure of the intranet is in place, there’s a good bulk of content available, tagged and categorised for browsing, or accessible via search. We’ve done our best job in designing and populating the intranet. But the proof is in the pudding now as this beta will enable further iterations and improvements via feedback from the staff. There is a feedback mechanism in place. Similar to GOV.UK, the footer on every page contains a feedback form that expands when you click the ‘Is something wrong?’ link. It’s a very simple form with one feedback box and it will automatically send details of the intranet page and staff email if logged in. Plus Google Analytics is in place so that we can start to analyse the patterns of incoming data. The bulk of the content on this intranet will fall into the ‘How do I?’ section. It’s made up of one page tasks and multi-page guides with concise content. The page is dominated by a search box that allows searching by category. There’s a useful tag cloud for browsing across categories. And staff can browse by individual category. The ‘How do I?’ landing page provides several ways for staff to get to the detailed information. This is an example of the IT category listings of tasks and guides. They are worded in plain English, as a staff member might search for them. Titles are short, typically five words or less, and in the active voice. Listing pages also contain a tag cloud for the individual category and a search box to search by category. The one-page answers are short and to the point. Guides contain more than one page and are paginated with next and previous options at the bottom of each page. The Content is King mantra lives on in this intranet project, and I feel that it is the content that will be the success of this intranet. It would be easy to screw this up by allowing reams and reams of ROT to accumulate. But the content team, lead by Lizzie Bruce, are keeping things simple and restricting content to an organised collection of information. The content really is simple, with some pages consisting of a one-line answer. No fluff. No vanity publishing. Real help for staff. 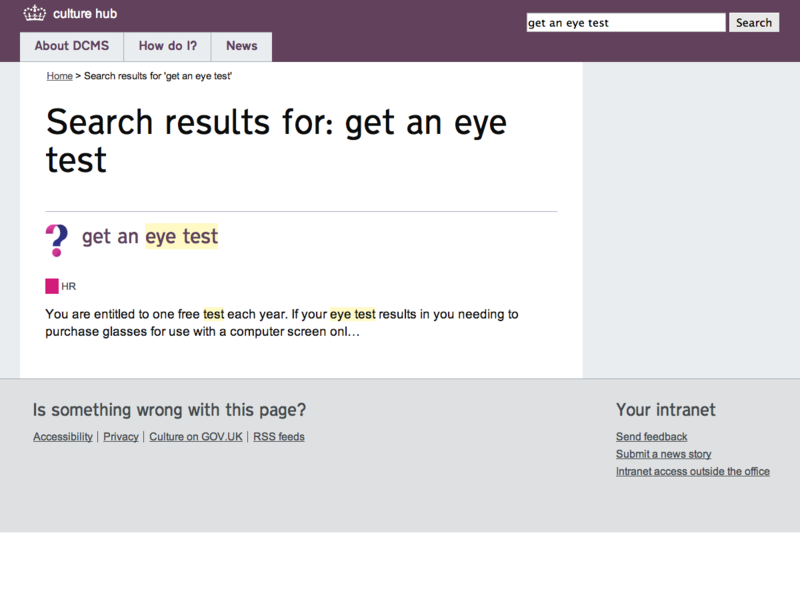 One of my popular search phrases that I use when testing intranet searches is ‘eye test’ (see Google search result examples). On the DCMS intranet there is one result. We’ll see how things progress with the addition of more content but because the content is good, the search results are good in testing. Also worth noting that no documents are included in results, only intranet pages. Tagged content works well when it is managed well. Tags are a core part of WordPress and have been a feature of most of the recent websites that we’ve launched. Their purpose is to act as a pivotal navigation mechanism to allow people to traverse difference parts of the website, viewing different types of content typically grouped under a tag. In using tags I find that content publishers try to think of as many different words that they can to use as tags. This is what we might do when applying keywords to a page. But tags are quite the opposite. Instead of thinking of all the different words that you can apply to one page, it’s better to think of all the different pages that you can apply to one tag word or phrase. A well-managed taxonomy will make for a better user experience and for better tag clouds with more possibility of discovering related content. Pages that are tagged with loads of random words will generate a very flat tag cloud and often means that when people click on a tag they are presented with one item on a search results page. If a tag only ever appears on one page then this creates a useless self-loop with no possibility of discovering other pages. 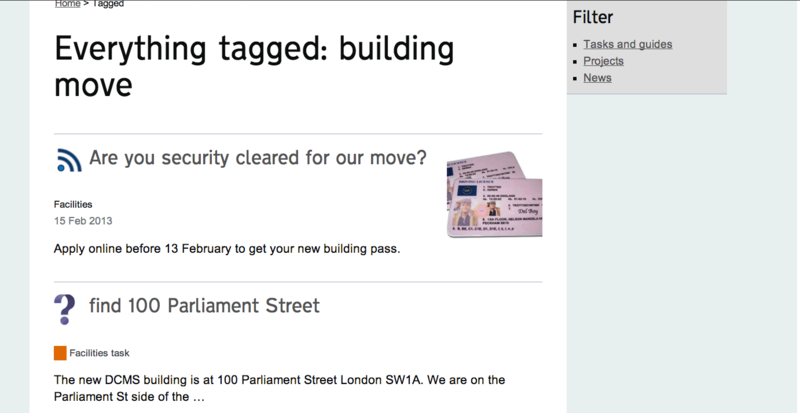 This example shows everything for the ‘building move’ tag, and allows filtering by tasks, projects or news. Half of the homepage is devoted to the corporate news feed where stories can feature photos and videos. Administrators can set emergency alert messages to appear at the top of the homepage. The other half of the homepage provides four sets of listings. The popular pages section displays intranet pages with the most pageviews over a week, generated from Google Analytics. The recently published section shows new or freshly updated pages. The forum area shows posts from the staff forums that are generating buzz. The departmental Twitter feed is on display – for as long as we can use the Twitter API. There are built-in controls to override the automated lists, so it’s possible to stick a news story to the top of the list for a week for those important announcements and longer campaigns. The new intranet framework is responsive. Like GOV.UK, it’s designed to adapt to mobile screens. But that’s no benefit if the only place to see the intranet is in the office on a desktop PC running a crusty version of Internet Explorer. This intranet, and I mean all of it, will be available securely via login on any device, for staff in the office, for staff using smartphones and tablets out in the field, working from home or on the move. For me it’s a first. Although we acknowledge that there are not going to be lots of job vacancies in the listings, there is an area for jobs. And these are linked up to projects where appropriate. As a mentioned when I introduced the new DCMS intranet in my last blog post, this is the first intranet where I’ve seen a dedicated projects area, highlighting everything the department is doing and how this ties in with wider government policy. It’s a great way of keeping staff in tune with current work. There are around 30 individual forums already setup for staff to use covering sports and social, staff networks, classified and general noticeboard. The team are seeding the forums with initial posts and will let staff use this area freely. Staff must register with their work email address so there are no anonymous posts. Forums that are generating replies will feature on the intranet homepage in a live feed. After weeks of development and content population the most exciting time will be the next week or so as we gather feedback from staff and make final functionality changes before the official launch, the building move and the switch off of the old intranet. Most intranets have a section that tells you about the organisation. 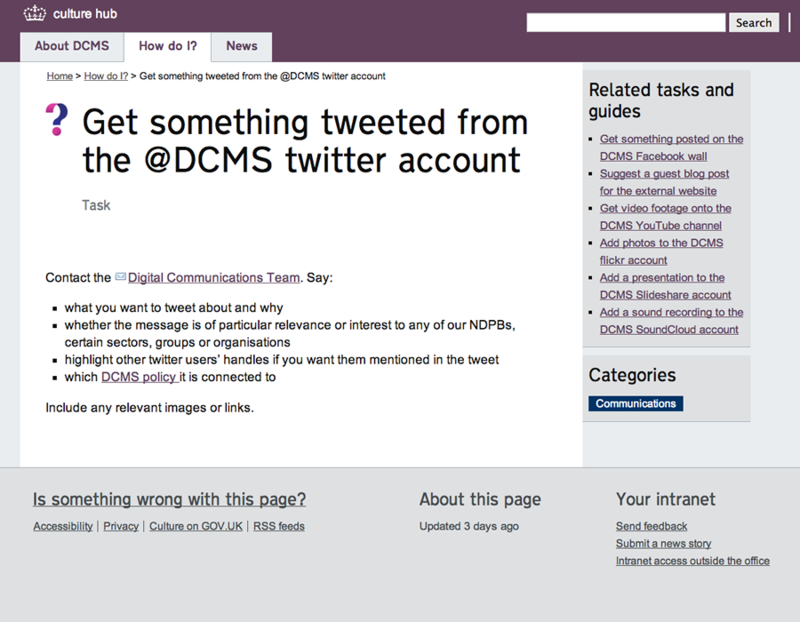 On the DCMS intranet this section contains the projects, vacancies and forums. There’s also a “Who we are area” that covers the typical what we do, ministers, board and org charts that you’d expect to find. However, there is no duplicated information. This section links to appropriate areas of GOV.UK, to individual board members, ministers and MPs for example. It makes for a very lightweight area of the intranet, good in search results, and it’s supported by the projects section which showcases current work. The news section is a little bit different to anything I’ve tried before, in terms of navigation. Acknowledging that news is transitory, we’re trialling a Twitter-style ajax loading feature that will display additional news items on the news homepage, instead of paging between page 1, page 2 etc. As we’ve started the intranet news section afresh, there’s not enough news as I write to trigger the loading feature, but it will be interesting to get feedback on this. Before official launch, the team are running a competition with staff to name the new intranet. It’s currently running with the name “Culture Hub”, and although I’ve never been one for pet names for “the intranet”, I’m kinda hoping our working title sticks. I started the new year by kicking off an intranet project with the very switched-on digital comms team at DCMS who wanted the next iteration of their intranet to follow the GDS design principles. The project brief for this new intranet was to develop a CMS to enable the digital comms team to manage a task-based set of content, with design and style inspired by GOV.UK and the GDS design principles. The team wanted to use tagging and categorisation to group, surface and link content across different parts of the intranet. And they wanted to radically reduce the amount of content and simplify navigation. I was very pleased to start work on this project. The team had already done a lot of the information architecture work in determining which elements of content will go onto the intranet, and how to organise it. 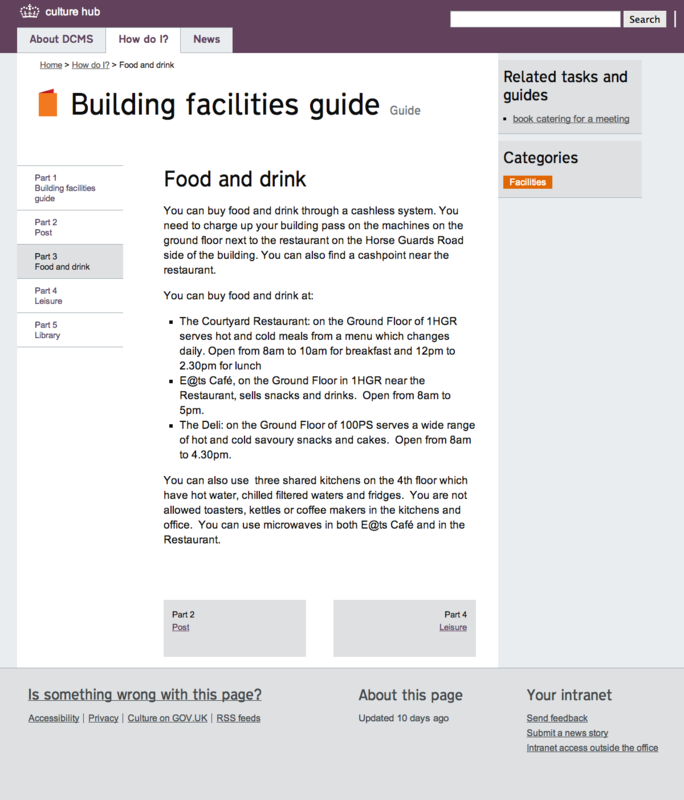 Adopting many of the GDS design principles in their work, the intranet will be geared around staff. It will act as a source of essential and useful guidance and information, and a place to discuss topics. Where information already exists elsewhere on other websites or internal systems then the intranet will link to it. No duplication. And in terms of content itself, the intranet will contain clearly-written tasks and guides giving information to staff. No vanity pages or stacks of rubbish that tends to be allowed to accumulate and fester on a badly-managed intranet. The intranet design is responsive, using GOV.UK-style fonts with big headings and large text. Clear signposting and minimal navigation makes it easy to use and read on any device. We went straight into prototype design for this project. No wireframes. The team had a working prototype to preview and play with just one week after kickoff. We’ve iterated and tweaked until what we have now will be the new intranet. Only three main navigation options and no left-hand menus on this intranet. No branches of pathways to navigate. Just a big pot of information, organised sensibly, accessible chiefly via a big search box, something that I have been longing to experiment with for ages. 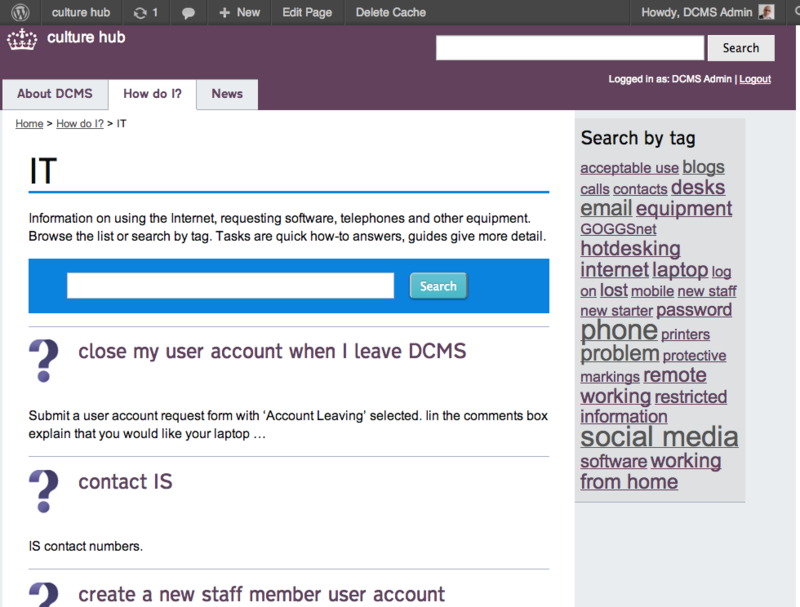 For staff who prefer to browse and navigate, and I still come across staff who shy away from search, there are lists of topics, organised by category and tagged to allow traversing across sections of the intranet. So it will be possible to hop around and browse, for example, all ministerial tasks or all broadband projects, or everything tagged building move whether it be news, tasks or job vacancies. 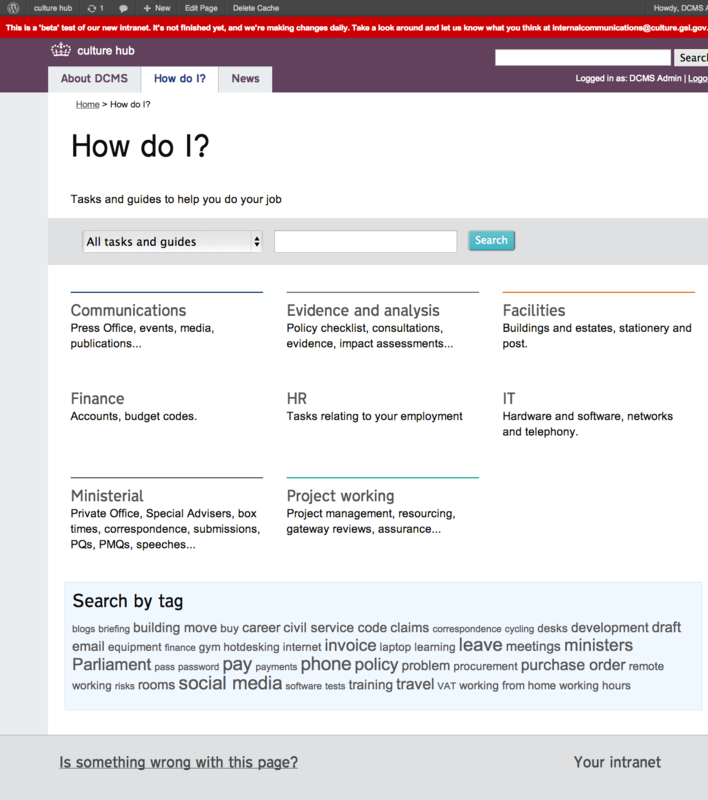 The bulk of the content is made up of tasks and guides, taken from the GOV.UK idea of quick answers and guides. This is your typical guidance section of the intranet. But this isn’t organised into never-ending sections of intranet pages, with annexes from an employee manual that span nine levels deep into the navigation. No. It is essentially a databank of answers to typical questions asked by staff. Some answers are short and quick and we’ve called these tasks. Some require a bit more information and we’ve called these guides. They all sit in the pot and are accessible via search or by browsing categories and tags. Tasks are one-page answers to common questions such as “get a replacement building pass” or “book a meeting room”. Guides, such as “using your desktop phone” or “facilities in the new building”, are a cluster of individual, one-page chapters, split into discrete, digestible chunks. The team will also manage internal vacancies through the intranet, linking these in closely with internal projects. In fact, this is the first intranet that I’ve worked on that will have a dedicated project area containing an overview of current programmes and projects in the department, high-level and detailed information, plus links to associated vacancies. This project section will highlight the actual work that is being done by DCMS and will help staff to feel involved in, and to understand the goals of the department and ultimately how this fits in with wider government policy. Staff will also have the chance to hang out in the forums in an open and unmoderated environment. In addition to the task-based content, there will be a blog for specific projects. And this seems to be the perfect answer to the age-old problem of vanity publishing. Wanna write about your department or project and showcase what you do? Fine. Not on the guidance section of this intranet, though. You’ll get your own area where you can write about what you do and get involved with staff who are interested. You’ll be responsible for keeping it up to date and for answering questions and comments from staff. Still interested? Sign-up here. Search works great because the intranet is not filled with piles of badly labelled rubbish deemed as absolutely essential intranet content by some un-digital head of department. The content is slick, well-written, well-titled and tagged. And there’s not mounds of it. Although there is a fair amount of room devoted to the corporate news feed, the homepage will provide aggregated feeds of the most active pages across core intranet content, powered by live data from Google Analytics, and topical buzz from the staff forums. It will also feature freshly-published content, and the departmental Twitter feed. From the publishing side of the fence, developing the CMS for the intranet in WordPress has been a dream come true for me. If you read my blog, you’ll be used to me moaning and complaining about the lack of an acceptable IT platform or not being allowed to use Open Source software or even a database when I worked at MoJ. Having these tools available to me now is like being the proverbial kid in the candy store. This is probably the smallest intranet that I’ve worked on. And it promises to be the most streamlined, task-based, user-focused and data-driven intranet that I’ve worked on, with well-managed content and governance for ongoing publishing. It will be a pleasure to handover this CMS to the content team, knowing that they will keep it pure. This will also be my shortest intranet project. We’ve not launched yet, but working with Open Source software in an agile manner, with a switched-on team who have managed their own content population, has meant that this intranet will have been designed, built and populated from scratch, within a two month timeframe. And the cost? A mere fraction of a drop in the ocean compared to the millions of pounds of public money that I have seen wasted on repeated efforts to get an intranet right. The new intranet preempts a move to a new building location, and will be used as a major source of news and information for staff on the move. DCMS will save money by moving to an Open Source solution and hosting from the G-Cloud and severing contracts with existing IT providers. Working agile in an agency environment means that we don’t have stand-up scrums every morning. But we do get the chance to develop, test and iterate in short sprints of work. Nothing makes for a great project like the people that you work with and it’s been a real pleasure to knuckle down with the DCMS digital comms team who have come up with a great concept for an intranet and obviously have the vision and backing at higher levels to make it happen, while doing other work on the public website move to GOV.UK.